KADUNA—Some Northern and Middle Belt leaders, yesterday, asked the Federal Government to rein in leader of Indigenous People of Biafra, IPOB, Nnamdi Kanu, having violated the bail conditions set before him by the court. Elder statesman, Tanko Yakasai, declared that the Federal Government’s decision to approach the court over Namdi Kanu was in order. Yakasai told Vanguard that the IPOB leader was granted bail on certain conditions, adding that if it was established that he had violated his bail conditions, it was up to court to decide. According to him, there is nothing wrong with Federal Government’s action, adding: “Kanu is under bail with certain conditions, if those conditions were breached, it was right for the government to approach the court for decision. Reacting in a similar manner, a member of Arewa Consultative Forum, ACF, Senator Joseph Waku, particularly called for the immediate detention of the IPOB leader. Waku, in an interview with Vanguard last night, said nobody was above the law, stressing that Nnamdi Kanu should not be an exception. He said: “Did he not violate his bail conditions? He should have his bail revoked and put back in jail. Nobody is above the law. The government should demonstrate thàt it is serious. 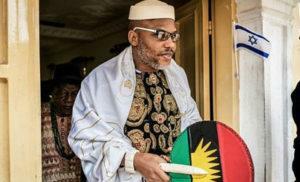 On his part, retired Police Commissioner, Alhaji Abubakar Tsav, said: “Kanu was not acquitted of the charges against him; he was only released on medical grounds. And the court gave him conditions which he appears to have violated. And he has developed a penchant for making trouble. Similarly, National Coordinator, Coalition for Governance and Change Initiative, Okpokwu Ogenyi, advised the IPOB leader to apologize to the people and government of Nigeria for violating his bail conditions. Okpokwu said: “He has breached his bail conditions and I keep emphasizing that an individual is not greater than a state. “So Kanu, having breached the constitutional bail granted him, ought to have apologized to Nigerians and the government of the Federal Republic of Nigeria. On his part, the National Coordinator of Miyatti Allah Cattle Breeders Association, MACBAN, Alhaji Garus Gololo, expressed a slightly different view, saying the issue of Kanu should be handled with utmost care in order not to aggravate an already heated situation. Government should give him another chance to make amends and by sticking to the conditions upon which he was granted bail. The post Yakassai, Waku, Tsav, others want FG to rein in Nnamdi Kanu appeared first on Vanguard News.